Roasted eggplant gives this vegan pesto a hint of smoky flavor while sun-dried tomatoes add a bright, tangy spark of flavor. This week on the FatFreeVegan Facebook page, I’ve been offering my suggestions for Fourth of July dishes–salads that transport well, veggie burgers you can make ahead and heat on the grill, etc. You can add a pasta salad tossed with this aromatic pesto to the list of foods you can bring and that everyone–vegan and non-vegan, health enthusiasts and hedonists–will enjoy. Traditional pesto combines basil with olive oil and, often, cheese, and vegan versions usually replace the cheese with nuts but keep the olive oil. As an oil-free vegan (OFV), I’m constantly looking for new ways to get the zesty basil and garlic flavor of pesto without the olive oil. I’ve made pesto with silken tofu, asparagus, white beans, and artichokes instead of oil with varying levels of success (asparagus is the prettiest, artichoke is the least flavorful), but I think I’ve hit on a new favorite. 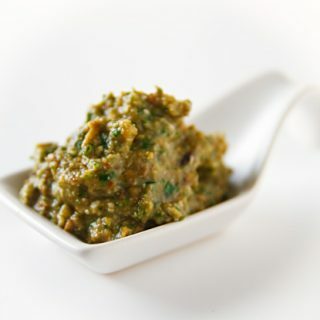 Though not the most attractive oil-alternative, roasted eggplant gives this pesto a hint of smoky flavor without overwhelming the other ingredients and makes a sauce whose consistency is more like traditional pesto than any of my other versions. Ground almonds and a little nutritional yeast supply a hint of cheesiness, and sun-dried tomatoes add a bright, tangy spark of flavor. The recipe makes a good bit, so plan to use it for several days in different ways. Add it to pasta and toss in fresh tomatoes, cucumbers, and other vegetables for a delicious pasta salad that you can serve cold or at room temperature. It’s also a delicious spread for bread; spread it on a hearty whole-grain bread as a substitute for garlic bread or to perk up a sandwich (try it with Italian sausages–you will not be disappointed!) And this may sound odd, but I tossed a little with some chickpeas for a tasty, albeit messy, snack. A little goes a long way, so don’t be afraid to freeze the leftovers for later use. Look for sun-dried tomatoes that are not packed in oil but are still soft and flexible. If they seem overly dried out, you will need to soak them in hot water before using. Preheat oven to 400F. Trim off and discard the stem end of eggplant and cut in half lengthwise. Place cut-side down on a baking sheet lined with a silicone liner or parchment paper. Pierce the backs of the eggplant with a fork in a few places. Bake until completely soft and somewhat collapsed, about 30 minutes. Remove from oven and allow to cool completely. This can be done ahead of time and stored in the refrigerator until ready to use. At least 2 hours before using (and up to overnight), place almonds in a bowl and cover completely with water. Allow to soak at room temperature. Drain water before using. Put the almonds, sun-dried tomatoes, and garlic into food processor and pulse to chop. Peel the eggplant and add it, the basil, and the nutritional yeast to the processor and process to a coarse puree. Add salt to taste and pulse to blend. 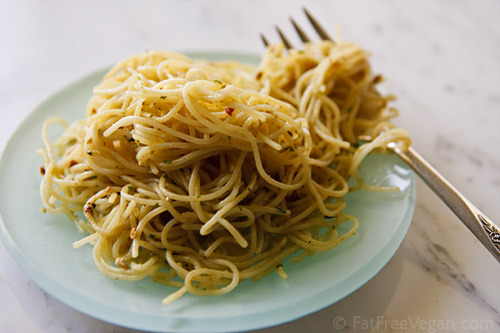 Add a tablespoon to a serving of warm pasta (if the pesto is too thick to easily coat the pasta, add a little hot water to it), or use as a spread for bread or a dip for crackers or vegetables. Store in a covered container. For best color, either press a sheet of plastic wrap onto the exposed surface or spray with a light film of olive oil. Sounds yummy! Printing recipe now! Love pesto and like this spin on it. I made this for lunch yesterday and while it turned out great, I could still taste a little bit of the bitterness of the eggplant in the pesto. Do you think salting it and letting it sit for a while before roasting it would help? Some eggplants are more bitter than others, and salting will usually help, but that mostly works for eggplant that has been sliced or chopped before cooking. Something else you can try: If you notice that your eggplant has a lot of seeds once it’s roasted, scrape out the seeds and discard them. They’re the cause of a lot of the bitterness. This turned out great! We added a pinch of paprika to spice it up a bit, and next time we might add an extra sun dried tomato or some lemon juice to give it some more tang. I might leave out the nut yeast to sprinkle on after as I find I want to put more salt on my food when I use it. I think this would be awesome as a layer in lasagna. We found some chili flavored spaghetti to use with this and it turned out perfectly with a nice little kick. Susan! This is the most amazing thing I’ve tried from your blog! I’ve tried quite a bit but this tops all.. scrumptious! Thank you.. amazing creativity. I actually like this way better than the oil based recipe I use, and now I can have pesto more often (and I LOVE it) because it’s not a fat+carb calorie super bomb. Thank you! We decided to have basil planted in several containers this summer. I was amazed at how much basil those plants produced! We made this recipe several times and LOVED it each time. I even turned my mom onto this recipe. Great idea with the roasted eggplant. Hello Susan, I am a regular reader and love almost every one of your recipes I try. I have a private blog where occasionally I post about foods or recipes I love (along with many other topics) When I use your recipes I’ve included the link – is that okay with you? I don’t post the actual recipe or photo, just send the readers (friends and family) to your sight. I just want to make sure that follows your copy right rules. That’s perfect, Marinda! Thanks for taking the time to ask! just made your roasted eggplant pesto…it was perfect on top of raw spiralized zucchini…i only soaked the almonds about an hour and it worked fine…just wondering why they needed to soak 2 hours or overnight?…i added more than 2 sun-dried tomatoes since i love them…all in all, easy, fast and even my carnivore, carb-less husband loved this meal….now just need to try on the kids! I loved it! Than you so much! I personally didn’t put the yeast (It is not common where I live , I couldn’t find it) and added only half a clove of garlic since it comes from my yard and it’s super strong this year. I also added a couple of fresh peppermint and lemon balm leaves from my tiny spice garden and used spiced salt in order to put less of it and give it a little bit more sting. Since I don’t write often I also wanted to tell you that I love your website! I foud so many good recipies in it! The only problem with your site, and in general with American ones, is to convert everything into grams because is soo much time consuming and hard to get it right. If it was in ouces it would be much easier to convert but unfortunately “cups and spoons”, especially for nuts or non-liquid things, are different for every single item and sometimes I honestly don’t know how you people manage to know how you measure how much of every ingredient. Susan, I’m an eggplant-lover like you, and an especially big fan of fire-roasted ones. Thought I’d share this roasted eggplant pesto I created. It’s loaded with cilantro and really good as a dip. Made it with pepitas since I didn’t have any almonds. Threw in an extra clove of garlic, because that’s how I roll! This was incredible, I just made it and the taste is heavenly. I love how we end up eating raw garlic which is so healthy. I translated to portuguese and wanted to know if it’s okay to share with your link to this post, thank you for creating this. My husband will be so surprised. I love your recipes, this website is wonderful. Yes, I think cashews or any other nut could be used, and you shouldn’t have to soak them. Hope you enjoy it! The cashews worked and it was amazing! Thanks! And what exactly is a “large” eggplant? In today’s cooking arena, recipes are usually more specific, aren’t they? Pounds, ounces, grams, cups, etc. Please! It won’t really matter if your eggplant is a few ounces bigger or smaller than the one I used. Just choose the largest one you can find. Sorry to seem so dense. I’m a new vegan and not used to cooking with some of these foods. When you say “one sun-dried tomato”, do you mean one strip (that’s how I seem them on the salad bars and in jars) or one whole tomato, sun-dried? One whole tomato, sun-dried, the kind in the plastic bags, not the oil-packed kind in jars. I bought a bag (never saw that before!). Each piece is quite little, about 1-1/2 inches long and looks like it’s one side or piece of a tomato. If they’re small, you could use four of them. If they feel very tough and leathery, soak them in warm water first. The kind I buy are soft, but I’ve seen others that are small and tough and need soaking. Geesh, I feel stupid. Almonds……raw, roasted? I assume not salted. With/without skins? Raw, with skins, unsalted. Sorry to have been so unclear. Are you new to this way of eating? You’re making me see that I shouldn’t presume we all are used to eating and cooking this way. Oh yes. VERY new! I have an eggplant in the oven right now but I have a feeling it’s too large for a half recipe. I never bought an eggplant before and the ones in the store ranged from huge to baby-sized. I found on the internet that 1 cup of basil was about 20 gms and that what I have to work with right now, so I figured I’d make 1/2 recipe with it. I’m enjoying learning all of this new stuff and experimenting in the kitchen again. I’m over 70 yrs old and have always been an Eastern European cook — with meat/potatoes or noodle dishes. Lots of dairy, etc. And my arthritis is already improving! Thank you for your help. That’s wonderful! I’m happy to help in any way. Thanks for your help in making my recipes more specific. Thank you for such a wonderful site. I have already made 3-4 of your recipes and they are wonderful. I can tell this will be my “go to” site for good food! OMG. I just made this. I blackened the eggplant over my gas stove for about 10 minutes and let them cool and peeled the skin off. Then followed the directions, although I’m guessing that I processed it a little too finely in my Vitamix. But the taste is scrumptious. This will be great on pizza and on steamed veggies and maybe even salad. So so so so so so good. Thank you Susan! This was fabulous. Thank you! Just made this pesto and it’s absolutely amazing! 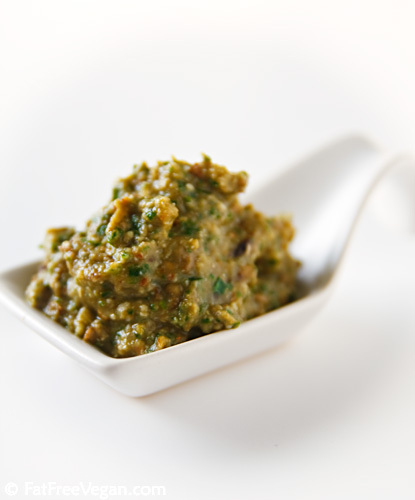 Had the chargrilled aubergine pesto by sacla but it was so greasy it made my stomach turn. This is so delicious and by far the best pesto I have had. I’ll be trying this recipe this coming weekend. And I want to mention – I’ve made pesto with chickpea water instead of oil and the pesto turned out well. Next time I’ll reduce it by about one quarter for a thicker consistency. The texture wasn’t the same as an oil base, but it carried the flavor and wasn’t watery. This is my new avocado toast! SO good. I threw in a couple handfuls of fresh spinach and it really helped with the “attractiveness” factor. I’m gonna try it next time without the almonds and see how it goes. I can’t imagine it would be anything but fantastic. I’m kicking myself for putting off making this for so long. My fridge will never be without it again! I was excited to try this recipe. I followed the instructions, as I am a Stickler about following the directions. After adding the eggplant, garlic, soaked almonds, basil into a food processor, it wouldn’t blend! Switched to a Magic Bullet and still wouldn’t blend. Finally used an old fashion hand mixer. Way to much work for finished product. How big a food processor did you use? Roasted eggplant is so soft I can’t imagine why t wouldn’t blend.